When you’re an archaeologist, you pretty much have an idea of what you’re going to find and where you’re going to find it. If you’re in the Egyptian desert for example, you’re bound to find a couple pyramids or two. 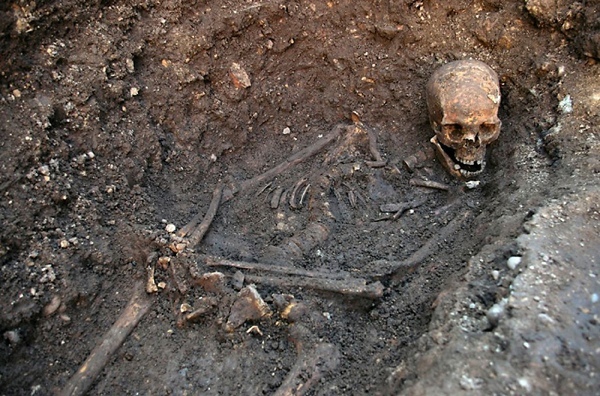 But King Richard’s remains under a Leicester car park? You don’t hear about that kind of discovery too often. So with last week’s discovery, we got to wondering what other archaeological discoveries have been found in unusual places? You’d be very much surprised! He was the king everyone loves to hate. King Richard III ruled England from 1483 until his death in 1485 but though his reign may have been short it was definitely not without controversy (to say the least). From usurping the crown from his very own nephews (then eventually having them killed) to ordering his own wife and brother killed, King Richard III was one of England’s most hated royal villains. So hated was he that in William Shakespeare’s play, Richard was depicted as an ugly hunchback whose outwardly deformed body represented his inwardly twisted mind. Thankfully, though his rule was relatively short as he met a violent death at the Battle of Bosworth. It was here that he suffered two fatal blows to the back of his head. Legend had it that upon death his body was unceremoniously dumped into the River Soar. Archaeologists however, firmly believed that Richard was actually buried at the Greyfriars Friary which is where the now infamous Leicester car park currently resides which as we found out last week is exactly where he came to be found. When someone thinks of Austria, they usually think of castles, schnitzel and Arnold Schwarzenegger. Well, how about the ruins of a Roman gladiator school? Well that’s exactly what archaeologists in Vienna, Austria found back in 2011. 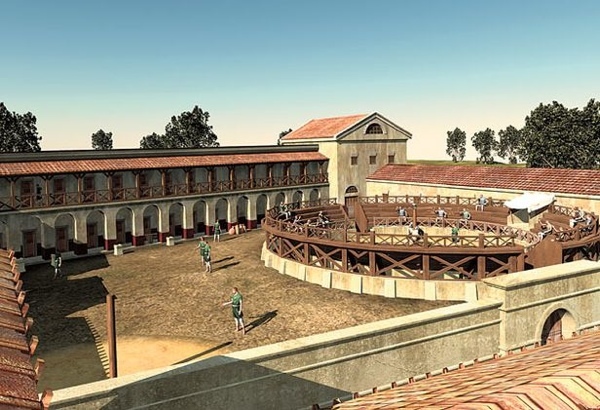 The school, located at Carnuntum Archaeological Park and near the Danube River, was erected around A.D. 150, during the reign of Roman Emperor Marcus Aurelius and is said to rival the Ludus Magnus, the largest gladiator training school in Rome. Partially excavated in 1923, archaeologists used state of the art ground sensors in 2011 to aide in the search for the remaining remnants of this grand structure. And what the archaeologists found astounded them. The entire complex covers 200,000 square feet (19,000 square meters) with a large inner courtyard, a bathing complex, training area, cemetery and cell like living quarters which measure only five meters square. It’s believed that Aurelius’ son Commodus saw his first gladiator match here and brought the idea of the sport back to Rome. 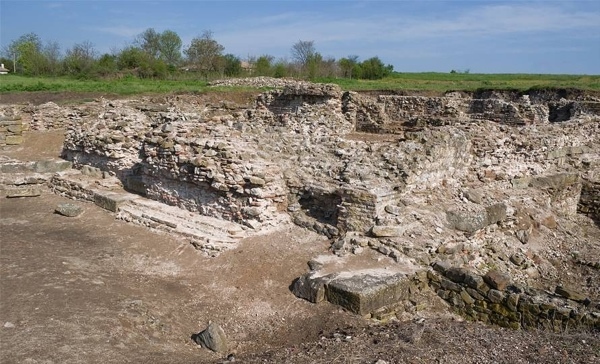 And while it may seem odd that a Roman gladiator school would be found in Austria, it makes perfect sense when one discovers that Carnuntum was the capital of the Roman province Pannonia which stretched over parts of what is now Austria, Hungary, Austria, Croatia, Serbia, Slovenia, Slovakia and Bosnia and Herzegovina. Every old house is known for an occasional sag and dip somewhere. 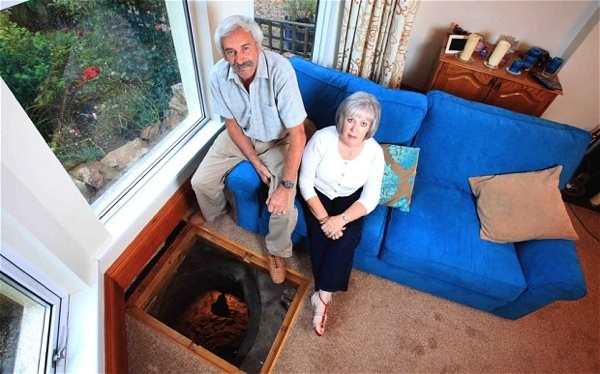 Colin Steer’s house in Plymouth Devon had such a dip in his living room and he decided to investigate further. So after digging seventeen feet for three days straight Steer made a historical discovery: a thirty-three foot medieval well dating from the 16th century. The well, which was built by Sir Francis Drake to carry water from Dartmoor to Plymouth, was covered over sometime around 1895. Steer said of the dip in his living room that he always wanted to dig it out to see “if I could find a pot of gold at the bottom.” Well, Steer didn’t find a pot of gold but along with the well he did find something else: a peasant’s sword also dating from the 16th century. As for the well that sits on display in his living room, Steer has installed lights inside the structure and keeps it safely covered with a trapdoor. It was a project that attracted controversy from the very beginning—the expansion of a road from Weymouth, Dorset to the lsle of Portland which passes through an Area of Outstanding Natural Beauty. 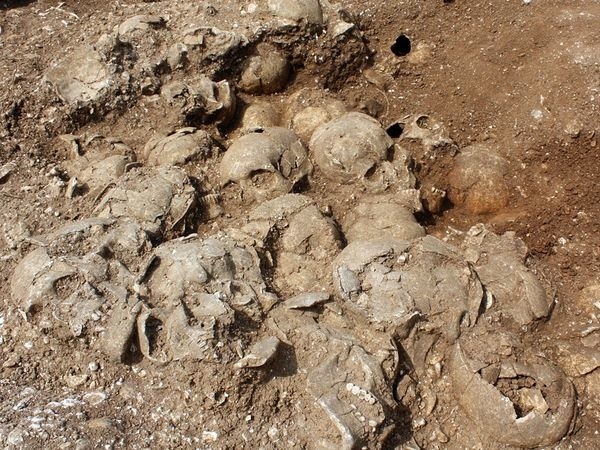 But what road crew workers found upon excavation was much more outstanding—a mass grave of fifty-four skeletons and fifty-one heads of Scandinavian men who were executed sometime between A.D. 910 and 1030. After further analysis, archaeologists determined that this could be the grave of the Jomsvikings, a merciless group that terrorized the coast of England around 1000. The bodies all showed evidence of a mass execution. All were found naked with their heads in one pile and their bodies in another. It also appeared some men attempted to fight back as some of them were found with their fingers sliced through. It also appeared that they were not all cleanly killed as some of them had multiple blows to the vertebra, jaw bone and skulls. As for why there they killed in Dorset, archaeologists have two theories: one is that these men were killed by their fellow Vikings as punishment for defection. The other theory is that as they left their Viking ship, the men were ambushed and walked straight into an organized group of Saxons who forced them to surrender and eventually wound up killing them. Back in 1849 in a little town called Charlotte, Vermont a railroad was being built to connect the little town to the capital city of Burlington. During the digging process, road crews were used to finding old arrowheads and spears but what they found next simply astounded them. Upon digging in a remote hillside, a large skull emerged. At first they thought it was the remains of a horse but as they continued digging and more of the skeleton appeared, they realized this was no horse as no legs were to be found. After the skeleton was fully unearthed, it measured nearly twenty feet long and seemed to resemble a large sea creature. No one however, could figure out how this animal wound up in this remote area some 250 miles from the nearest ocean. Well, after examining the skeleton, geologists got their theory. The creature, who came to be known as Charlotte, was actually an 11,000 year old white whale who swam into shallow water and eventually died near the outlet of a river. As the body became covered in silt, it remained protected from scavengers and thusly was left to decompose slowly which in turn left the bones to remain completely intact. As this was occurring, the ice age was slowly retreating from Vermont and a phenomenon known as a “glacial rebound” was occurring where “formerly glaciated land springs back after the weight of the ice is removed.” And that is how Charlotte the whale came to be found under the train tracks of this sleepy little town in Vermont. As we saw in entry number seven, the Vikings may not have been so warmly welcomed in the UK But from what archaeologists discovered on Baffin Island in Newfoundland they may actually have been partners with the Native Americans in a transatlantic trading network. 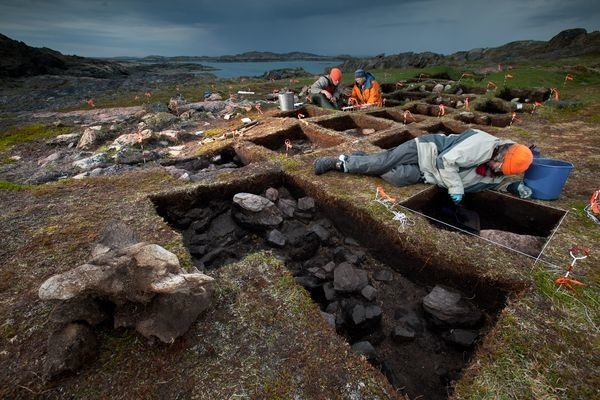 While excavating an ancient building on Baffin Island, archaeologists discovered evidence of an ancient Viking outpost. The items found were whetstones, Viking yarn, bronze artifacts that were known to have been manufactured by Viking metal smiths and a whalebone shovel similar to those used by Viking settlers in Greenland. It is known that Viking seafarers did set sail for the New World in A.D. 1000 and that Leif Ericksson, a Viking chieftain did stop on Baffin Island for a short time to explore the coastline. Archaeologists also believe that Viking seafarers travelled to the Canadian arctic in search of various northern luxuries that were prized by medieval noblemen. It’s believed that in exchange for these prized possessions, Viking traders offered bits of iron and pieces of wood that could be carved into figurines and other goods. Every do-it-yourselfer enjoys the process of renovating their home. But imagine scraping the paint off your walls and as the plaster slowly falls away a centuries old Mayan mural slowly appears. Well, that is what happened to Lucas Asicona Ramírez of Guatemala as he was renovating his family kitchen. The house, which is located in the small town of Chajul, is almost 300 years old. Though archaeologists have no idea who the original owner was, they are certain the person was someone quite important. 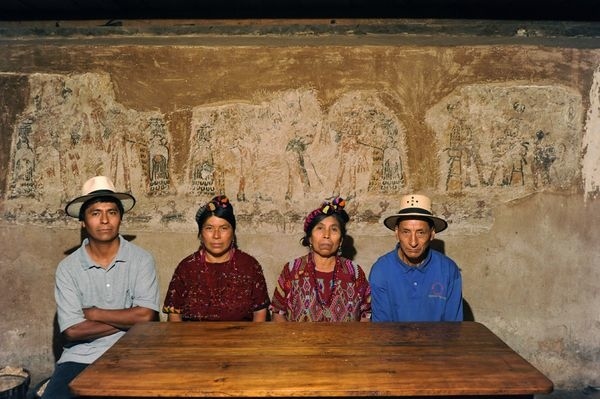 According to archaeologists, the uncovered images were painted on the oldest plaster layers of the walls and were probably created after the Spanish conquest of Guatemala sometime in the 16th century. The style of the murals are reminiscent of those found in 17th–18th century illustrated texts from the region. And while the condition of the murals is fairly decent, archaeologists have noticed some decay as people live and cook in the space. As for Ramirez, who is a modern day descendant of the Mayan civilization, he hopes to convert the room into a small museum but he doesn’t have enough money as yet to do so. Bulgaria is known for its beautiful beaches and mountainous countryside. But back in the second century, Bulgaria was known as “Little Rome”. This title was verified when a gravesite of Roman soldiers was uncovered during a construction accident. According to reports, workers were pouring concrete for a construction job in the town of Debelt and due to the vibration of the concrete mixer, the ground cracked and a tomb was uncovered. Archaeologists say the tomb belongs to soldiers from the eighth legion of Augustus. In its Roman heyday, Debelt was known as Deultum and according to the other items that were found there, Deultum held an important place in the Roman Empire. Among the items found there were gold jewelry needles, beads, scrapers used for bathing and massage, medicine, and gold medallions. 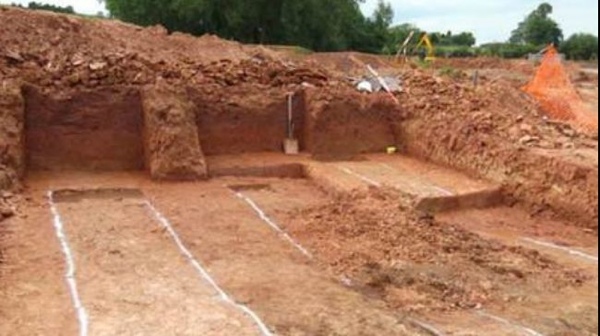 While excavating for a proposed housing development in the town of Monmouth, Wales, construction workers found timber foundations of a massive building that sat on the property years and years ago. As it turns out however, the “years and years ago” may actually predate the pyramids in Egypt. Created from what appear to be entire tree trunks, the foundation measures more than fifty feet in length and more than three feet across. When archaeologists did some testing, they found the structure could possibly be early Neolithic, at about 6,500 years old, thus predating Egypt’s pyramids by about 2,000 years making it the oldest structure in the world. Archaeologists believe it was built on the site of a long lost lake which silted up over time thus preserving the structure. It’s also believed that the structure was a “long house” which would have been a home to a family and perhaps used for gatherings and meetings. Talk about a royal flush! 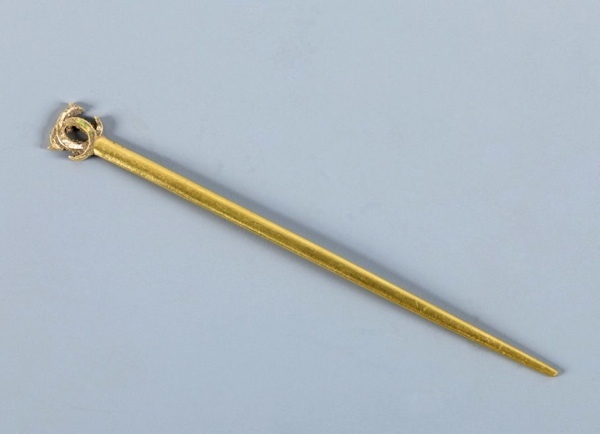 During restoration of Paris’ Fontainebleau Palace, workers made the discovery of a lifetime when they found a hairpin belonging to the 16th century French Queen Catherine de Medici in a communal latrine. The hairpin, which measures 3.5 inches, was easily identified as it had the interlocking Cs for Catherine as well as her white and green colors. What is a real mystery however, is how the hairpin wound up in the communal latrine. As Queen of France, Catherine very much likely had her own royal commode so finding this pin in a communal latrine was quite surprising. Making this find even more valuable however, is that Catherine, who was married to King Henry II from 1547 until his death in 1559, was known to have an extensive jewelry collection yet very little of it has ever been found. Elaine loves ancient history, laughing and being organized therefore she believes LISTVERSE is the perfect place to display her talents.